My, how time flies! Can you believe that the Heroes Discussion Group is celebrating it’s 50th (that’s right, 50th!!) meeting already?! Now for some of you this will come as no surprise, as you have been in attendance for most of these one-of-a-kind meeting of the minds, but for the rest of you who are reading this and asking yourself, “What’s the Heroes Discussion Group?”, here’s Heroes own Seth Peagler and Discussion Group moderator Andy Mansell to elaborate! 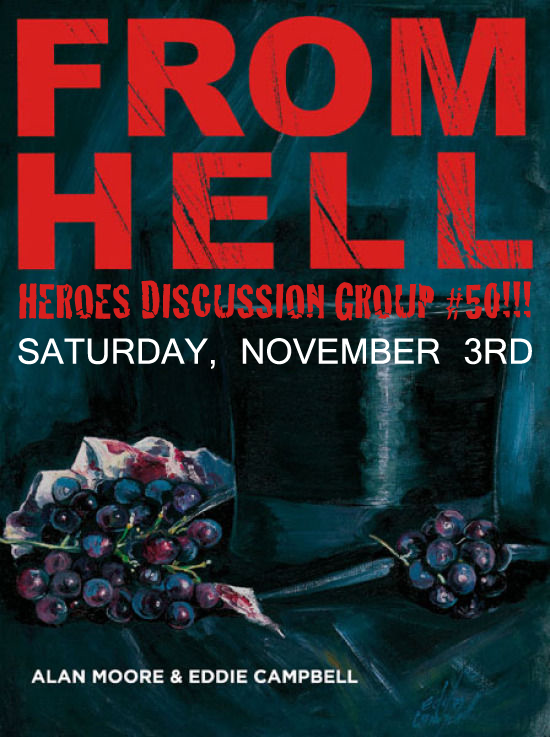 Be sure to join us on Saturday, November 3rd when the Heroes Discussion Group finally tackles the horror classic “From Hell”. The group meets at the shop at 1pm! Don’t miss it! From Hell Discussion Group November 3rd at 1:00pm REMINDER!! Just a reminder that the Heroes Discussion Group will celebrate its 50th meeting by examining From Hell—Alan Moore and Eddie Campbell’s retelling of the Whitechapel Murders attributed to Jack the Ripper. but especially– Chapter 4— where Gull takes Netley on a Masonic tour of England. The Freemasons, Queen Victoria, Fred Abberline, how the end-notes and Epilogue affect the reading experience, the role of the Media in creating a legend but above all, how Moore & Campbell walk that pesky tight-rope between fact and fiction. We look forward to seeing you on Saturday November 3rd at 1:00pm. As usual, From Hell is available from Heroes with the 10% Discussion Group Discount–just remember to mention it when you check out. And remember, in next couple of months we will examine the work of Gilbert Hernandez and Jeff Smith’s Bone! HEROES DISCUSSION GROUP:: FROM HELL :: SATURDAY, NOVEMBER 03, 2012 1:00pm!!!!! 50 Discussion Groups! We did it!!! Our thanks to all who have attended, contributed and supported this worthwhile venture of ours! And to celebrate this momentous anniversary, we are breaking out the big guns. Plan to join us on Saturday November 3rd at (the usual time) 1:00pm!!!!!!!! as we sit down to analyze and dissect (heh) From Hell— Alan Moore and Eddie Campbell’s epic fictional examination of the Whitechapel Murders historically attributed to the notorious Jack the Ripper. This is no ordinary comic book. From Hell is filled with many intense passages where Moore and Campbell use their combined skills to draw the reader right into the world of late 19th Century London. 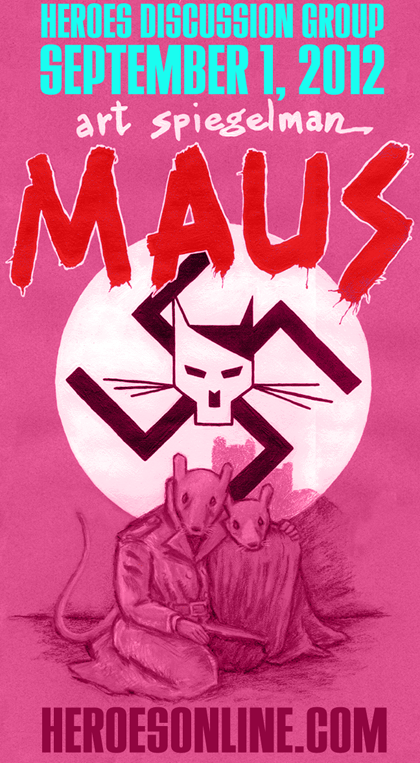 All the filth, all the corruption, all the intrigue but above all– page after page of great storytelling and fabulous artwork. From Hell is a true tour-de-force. But be forewarned: this is not “the feel good book of the fall“. From Hell is tough, it is gritty, it is adult but above all, it is magnificent. Due to its length and depth, it will take you quite a bit longer to read than most of our other Discussion Group books. So plan accordingly– we strongly suggest you read it in chapters. Don’t over do it and read too much in single sittings –the book can begin to overwhelm the reader. And….The footnotes (or end-notes). Although they are not required, many of them are worth reading and they add to the entire From Hell reading experience. As we get closer to November 3rd, we will provide a short list of End notes that we believe are crucial to the analysis of the story. But regardless–we urge you to read all of the end notes to chapter 4. It makes that particular chapter a true high water mark in comic literature! This is not an overstatement. As usual, Heroes is offering the (patent pending) 10% Discussion Group Discount on From Hell. Just remember to mention it when you check out. Don’t forget we have Gilbert Hernandez Human Diastrophism and Jeff Smith’s masterpiece Bone coming up in the next few months! All are welcome to join the discussion, but be aware that this is a book and a discussion strictly for grown ups. Even Freemasons will be welcome, but they better know the Heroes Discussion Group Handshake[TM] or they can go take a flying leap into the Thames. Bunch of tossers.